new undies for the new year? As I reflect on 2018 and look forward to 2019, I can’t help but feel enormous happiness and excitement. 2018 was a year to be remembered and I want to share some of my very favorite things from this year with you. The highlight of 2018 was Michaela’s birth! 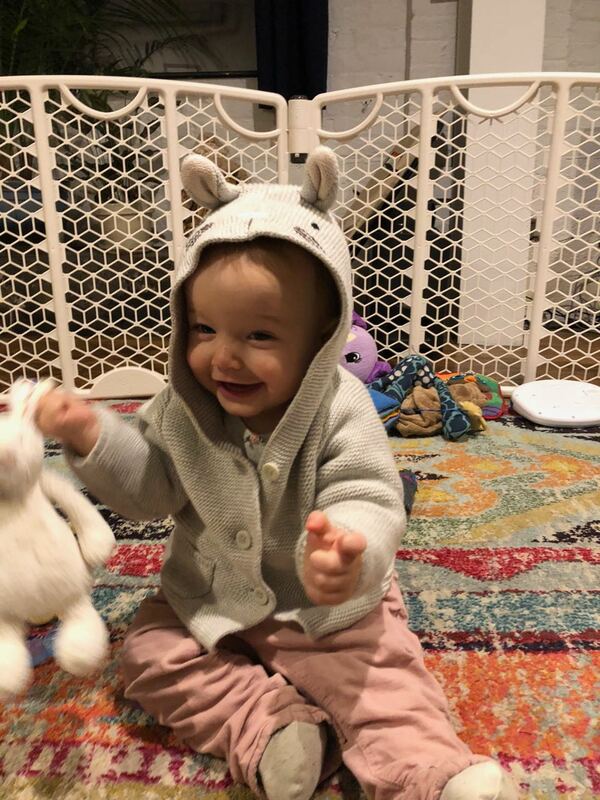 Our newest granddaughter, and the first child of my son Jonathan and his wife Jessica, is full of joy and laughter. Her smile and laugh melt my heart. In fact, she, along with my other grandchildren are my greatest inspiration. 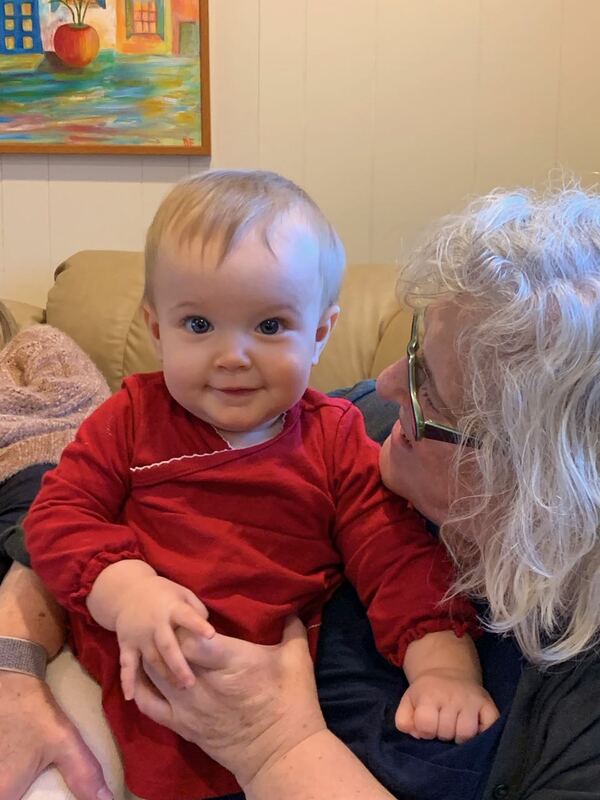 Heidi and I have loved every minute with our three grandchildren this year. We have enjoyed trips to the park, baby music class, holiday celebrations, and a family beach vacation in September. We truly cherished 2018 with them. Some of my other 2018 highlights include discovering new books, art and office supplies, and artists. Perhaps my list will lead you to new discoveries too. The Rosie Project: A Novel by Graeme Simsion. Witty and very funny. 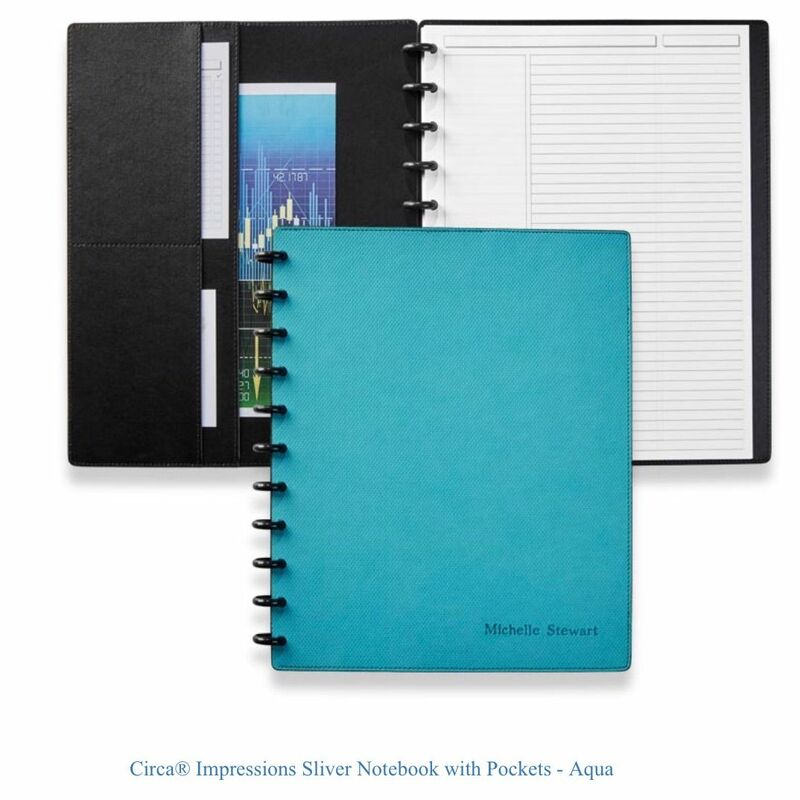 Levenger Switch, swap, and rearrange pages as you please with the Levenger Circa Notebook System. One of the artists at the Asheville Mastermind Workshop had this notebook and I fell in love with it. She gave me all the info and as soon as I got back I ordered mine in my favorite color, turquoise, or aqua as they call it. I LOVE it. Papers go in so easily. You have to read about it to know how it works. 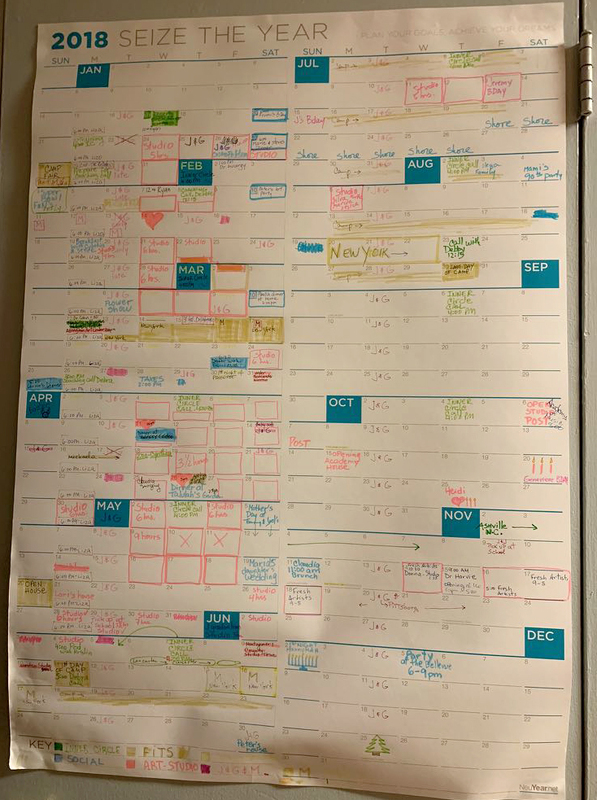 Mine is all ready for 2019 and will help keep me organized during what is shaping up to be a very busy new year. 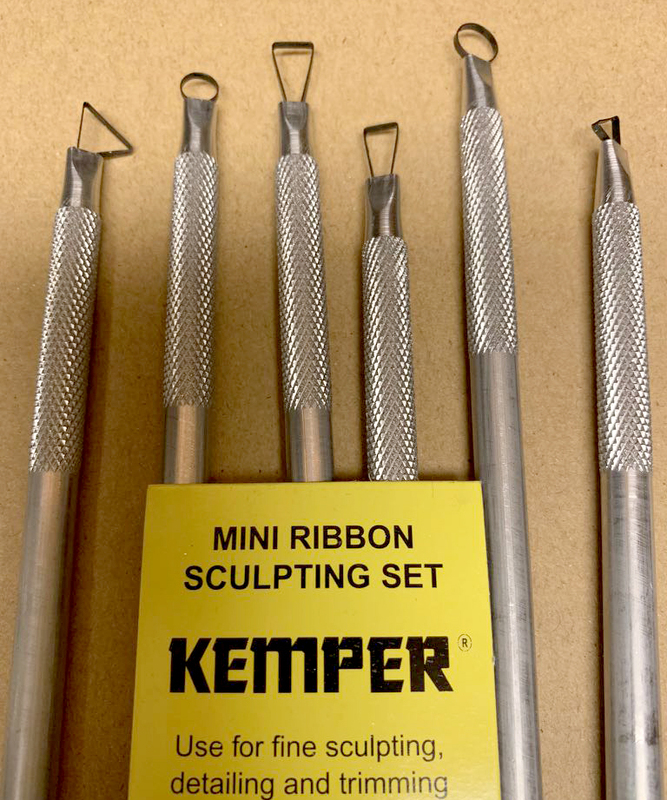 Kemper Tools: Mini Ribbon Sculpting Tool Set, 5” long. I found these little tools while walking around in Asheville, NC. We happened upon a wonderful arts and craft store that had everything you could possibly need even if you didn’t know you needed it, or that it even existed.. It was a privately owned store run by a pair of aging hippies who still retained their flower power. They carried marvelous things, from carpenter tools to knitting tools. From sculpting tools to gardening tools. From yarn to paint. Spinning wheels to clay. Weaving frames to easels. In a little corner I found these mini sculpting tools which I love to work with on my encaustic paintings. Great for scraping and building up the wax. Wish I could remember the name of this awesome store. Yearlong Calendar: This is one of my very favorite new things that I began in 2018. I hung up a year long calendar on my pantry door. It is very cool to see your whole year in front of your eyes. I color coded mine. It was definitely helpful. The 2019 one is erasable, a feature that I like. Donna Uettwiller To put it simply, I am eternally in her debt. She is my assistant, my sounding board, my moral support, my lifeline to the “e world,” my editor, and my friend. That said, Donna has been my friend for almost twenty years and has now become an integral member of Doraficherart. She assists me by photographing my art and helps me to write my blog by weeding through my scattered thoughts to find a coherent thread of what I am trying to communicate to you. In just a few hours a week, she is able to work her magic, an alchemist at creating a finished product out of my scattered thoughts. Donna is an amazing photographer. Check out her photos here—>website. Thank you, Donna! I saw quite a few art exhibitions this year here in Philly and during my travels to Asheville and Lancaster. The one that mostly stands out is one I just saw at the Guggenheim museum this past week: Hilma af Klint: Paintings for the Future. I had not heard of her until a few weeks ago reading friend’s posts on facebook. I was fascinated with her work. You can read all about her and see her paintings in the links above. It felt like her work was meant to be displayed at the Guggenheim. And, because this time of year is full of favorite traditions, I’ll close by sharing my family’s New Year’s Eve tradition! On New Years Eve, all members my family wear a brand new pair of underwear. Some of them even say the color you select should match your wishes for the coming year. 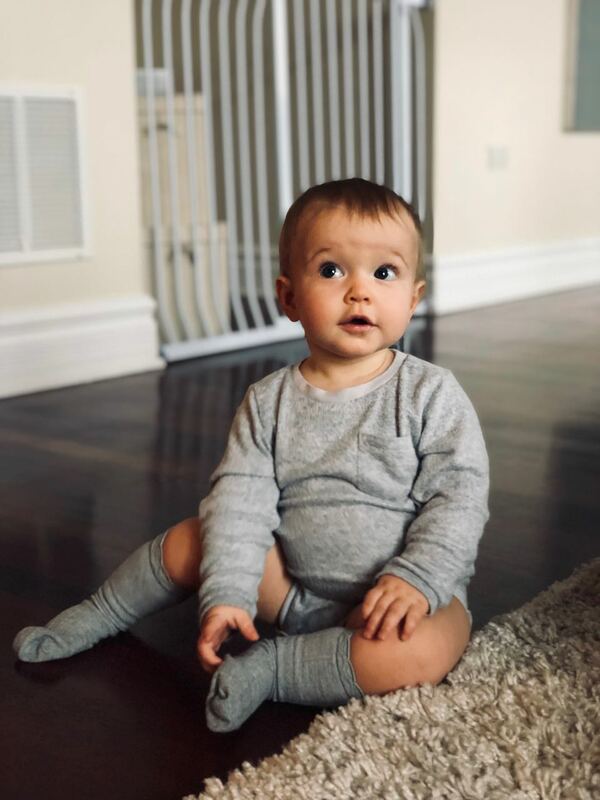 It may sound silly or superstitious, but, for our family, wearing new undies ensures we welcome the new year ready for a fresh start. I have always done it and, so…we will be wearing new undies to welcome 2019! I’m not sure if this is just an Argentinian custom but I have done my best to encourage its growth in the USA. So now I’m wondering about other family customs. Do you have any special traditions in your family, holiday related or not ? I would love to hear about them so I hope you leave me a comment here. I want to thank all of you for supporting my passion of creating and my art business. Happy New Year, my Friends! May 2019 bring you much Happiness, good health, prosperity and PEACE. ***Stay tune for details about my two upcoming exhibitions opening in January. More about it next week. As you may know, I traveled to Asheville, North Carolina last week to participate in Alyson Stanfield’s Art Biz Mastermind Workshop. As I begin to make a transition into being a full-time artist, it’s invaluable to me to take part in workshops that will help me clarify my goals and reflect on my past achievements. While I’d love to do nothing but paint, turning my art into a successful business will require me to invest in the “business” aspects of my art and impose some discipline into my best practices. Lucky for me Alyson’s workshop was exactly what I needed. It provided me with the opportunity to not only focus on my goals and the tasks needed to support them, but also to connect with others working through the same process. I learned so much from the group! Asheville wasn’t all workshop time though! Heidi and I visited studios throughout the expansive River Arts District and I got together with a few local artists who work with mixed media and encaustic. I loved that all the studios are open to the public every day of the week and I am amazed by how supportive the artist community is in Asheville. I am inspired,too, by so many who have successfully turned their art into a career. With many hours to reflect on the train ride home, I doodled and considered my goals going forward. I find that my greatest hope is that my art will bring forth feelings of happiness and positivity. Art can and does change the energy around us and I endeavor to be a part of generating a shift that promotes feelings of joy and cheerfulness. To that end, I want to create a variety of ways my art can be accessible to anyone who wants to collect it. Upon my return home, I have begun creating larger pieces while also taking time to compose collections of small pieces too. I will continue to work both digitally at home and with mixed media in my studio. Last week was truly transformative for me. Thank you Alyson and all of the other artists who took part in the Asheville workshop. If you are an artist looking for this kind of guidance, consider Alyson’s Art Biz Mastermind Workshops. The next one is scheduled for February 5th – 6th in Atlanta, Georgia. I am excited to announce that, after 28 years of having so much Fun in the Sun with so many fabulous children, I have retired from my summer camp. I will now be a full time Artist, a life long goal, for the first time. I am so very excited and can’t wait to see what I can do in the studio with all of the extra time. As you probably know, I have been an artist my whole life. During the past 6-7 years I have found a passion for working with encaustic, an ancient art form that allows me to paint with molten wax. 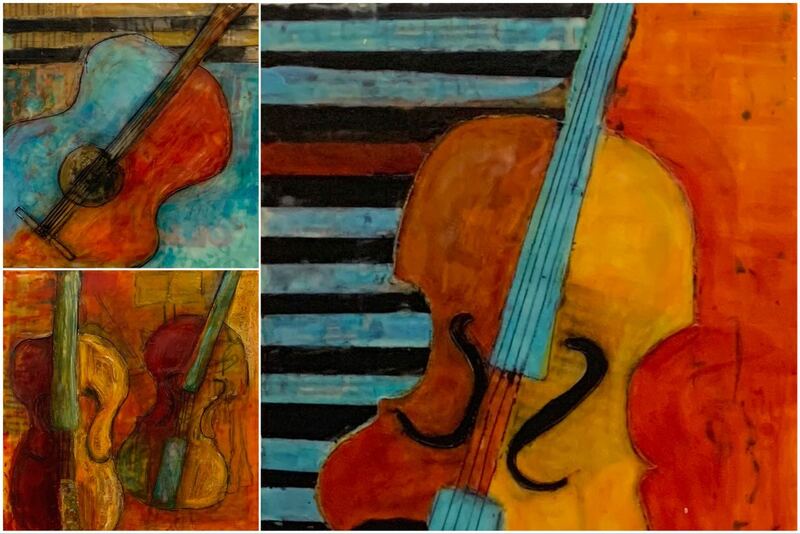 Though I will continue to create art using a diverse set of mediums, techniques, and tools, like collage, oil sticks, oil paints, pen and inks, and acrylics, I am excited for the extra time to really dive back into my encaustic paintings and encaustic monotypes. I want to thank my business partner, Bonnie Templin, for 28 wonderful years watching hundreds of children grow up, year after year, during the summers at Fun in the Sun Camp – and, that includes our own children! At the conclusion of summer, we turned the camp over to Bonnie’s son, Rob Carter. Rob grew up at Fun in the Sun, first as a camper, then as a counselor, and for the past two years, as the camp’s director. He brings in-depth experience and limitless patience for children and their needs. He is an innovator always seeking more ways to create a fulfilling camp experience for all campers. I will truly miss the campers, their families, and the staff, but I promise to visit. As I shift gears and head into my studio full-time, I look forward to progressing a few unfinished pieces, experimenting with new techniques and mediums, and taking advantage of the extra time to lead workshops! In fact, I already have one planned for April 5-7 2019! I will be co-leading a workshop in my studio with my good friend and peer, Lorraine Glessner. I am also looking forward to opening my studio up to visitors again this year for Philadelphia Open Studio Tours (POST) on October 7th. POST is a program of The Center for Emerging Visual Artists that gives tour goers the opportunity to visit studio spaces, experience artist demos, and talk face-to-face with artists from more than twenty Philadelphia neighborhoods. To learn more about this fabulous self-guided tour, visit POST. More from me about what is next soon. I anticipate having lots of art news to share with you in the coming months, including my annual calendar sale announcement and details of upcoming art focused trips. In the meantime, drop me a note and let me know what you’d like to see coming out of my studio in the next year. I am eager to hear your thoughts! How Do You Title Your Work? Like many artists, naming my artwork can sometimes feel like a daunting task. There is so much to consider. Names should illuminate a defining element of the piece while also being original. They should assist the viewer to make a connection, but also embrace diverse interpretations. A title could mean the difference between a buyer connecting with the work or being turned off by it. No wonder the task feels like one of the hardest things to do as an artist! Over the years I have approached naming in a variety of ways. Often, and especially with my musical body of work, I relate my titles back to my life with my father. During my childhood we often would lay on the rug together and listened to music. Words from those days come to my mind as I view my work. For example, my most recent encaustic piece, “Allegro” was named in this manner. “Allegro” is a lively, cheerful musical tempo and an element I see in this piece. Another recent piece I named using this convention is called, “Overture.” Like an orchestral overture, for me, the motion in this encaustic painting evokes the feeling of something about to begin. My varied naming techniques ultimately assist me, yet I find myself wanting to find an easier approach to coming up with good titles. What is your approach? How is it working for you? As some of you know, I started June off by attending a 2-day Art Biz Mastermind Workshop in Lancaster, PA with one of my favorite people, Art Biz Coach Alyson Stanfield. Alyson’s workshops provide me with the opportunity to invest in myself. We were matching Alyson (far right)…very colorful. The Art Biz Mastermind Workshop is intended to help artists focus on and plan the “business” of our art. Alyson’s wisdom and feedback are invaluable as we examine what we do to support the business aspects of being artists. Collectively, we share our experiences and support one another to contemplate and explore new possibilities for ourselves. We also share our own best practices and, in the end, finalize a plan for ourselves. The guidance I receive from other artists and Alyson is invaluable to me as I work to grow as an artist. And we enjoy one another too! I met so many awesome artists in person. I always doodle during workshops. It keeps me focused. Music always emerges in my doodles. Creating art is intuitive for me. Engaging in the business of art is something I need support and guidance to accomplish. I am grateful for these re-focusing and planning opportunities! And, it is always wonderful to spend time with Alyson Stanfield. Enjoy this sneak peak of just a few of my encaustic monotypes planned for the Montgomery County Studio Tour this weekend. I am excited to be among a group of artists selected to showcase my work at this year’s Montgomery County Studio Tour! The tour features 52 artists and 21 studios. For more details, click here. My work will be exhibited at the Glessner Studio – 24 Robbins Avenue, Rockledge, PA 19046. And, to learn about the other wonderful artists I am exhibiting with at Lorraine Glessner’s Studio, use the links below! This artist’s life isn’t always about wax, hot boxes, and bold colors!! Many days in the studio are, but the days and weeks leading up to exhibitions are about getting all of those art works ready to be seen and sold. As you know, the Montgomery County Studio Tour is coming up on June 9th and 10th and, so, Heidi and I have been busily mounting, framing, naming, and labeling my body of encaustic monotypes for the exhibition. The adhesive mediums and blow torches are in overdrive! While it is certainly a change of pace in the studio, it feels great to see everything come together. It is positively thrilling to experience the impact mounting, for example, has on my monotypes! Lorraine Glessner, Karen Freedman, and Julie Miller. I have so much new art to share with you. Everything from monotypes raging in size from 24″ x 36″ to 5″ x 5″ to a selection of my original “doodles.” I hope you will stop by and/or plan to take the entire tour! I am excited to be among a group of artists selected to showcase my work at this year’s Montgomery County Studio Tour! The tour features 51 artists and 20 studios. For more details, click here. For information about the Glessner Studio, where my work will be exhibited, click here. And, to learn about the other wonderful artists I am exhibiting with at the Glessner Studio, use the links below! “Philly from my window” First day of spring. It seems more like Christmas time these last few weeks. This is our 4th Nor-easter in Philly this March. I’m not giving up though, Spring will be here any day now, right? Every few blog posts I have been featuring an artist who inspires, motivates, and guides me. The last two were Argentinian artists. Today I am excited to tell you about my friend, artist Lorraine Glessner. I met Lorraine or Lori, as I call her, about 9 years ago when I became curious about and interested in learning more about encaustic painting. I was looking for an artist to teach me encaustic techniques and, after much searching, I found Lori. I took a private 2 day workshop with her back then; learned from her and fell in love with bees wax and everything related to encaustic painting! Since then, we have become very good friends and I have taken many more group classes with her throughout the years. She has taught me so much about painting with encaustic and I absolutely love her work! That is why I wanted to share it with you. I hope you have enjoyed this small taste of Lori’s work. I encourage you to visit her website to explore her and her art more fully, you won’t regret it! Check out her blog as well. I never miss her posts, they are always insightful and thought provoking. You can also read an older blog post of mine where I interview Lori. Benito Quinquela Martín – His Impact on La Boca and Me! My painting called “Tango” of La Boca. As an artist, I often find my inspiration from the intricate connections between colors and patterns. I notice these aspects in the world around me; in architecture, the variety within landscapes, and the tones and quality of light. Too, I see a little piece of my native Argentina in the elements of my work. When I reflect on my development as an artist, I can clearly see how others have also left an indelible mark on me and contributed to my evolution over time. Over the next few months, I plan to highlight other artists who have inspired me or helped mold me. I hope you will enjoy learning about these wonderful artists. To start, I will begin with an artist who made an impression on me way back when I was in art school in Buenos Aires. Benito Quinquela Martín, “a man who is a synonym for the neighborhood of La Boca” is known for his colorful depictions of ports, ships, and port life in his beloved neighborhood. My friends and I used to go to La Boca and sit in the street or in a park to take it all in and paint. We were in awe of the color! Benito Quinquela Martín’s presence is still visible throughout the neighborhood of La Boca today – a vibrant place full of energy, music and street performances. And Martín’s bold palette surely impacted me! Give the gift of art this holiday season. Subscribe to our mailing list and enjoy this month’s calendar artwork as a free screensaver. you and to provide updates on her art. process your information in accordance with these terms.